Webster University's Geneva campus recently hosted an Iranian delegation of business leaders and entrepreneurs under the leadership of Masoud Khansari, president of the Tehran Chamber of Commerce. 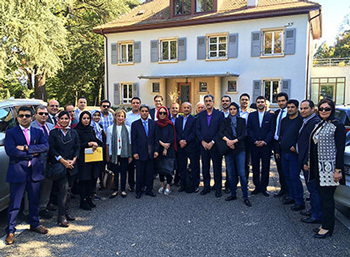 The director and the chairman of the Iran-Switzerland Chamber of Commerce selected Webster University as the academic focus of the delegation's visit to Geneva, and as a follow-up of Webster's “Doing Business in Iran” conference held last May, also at the Geneva campus. The visit centered on human capital development. While on campus, the delegation also learned about Webster's range of programs, including business, computer science, international relations, and psychology and counseling. See the original post at Webster Geneva.